The most powerful operating system in micro-volume provides flexibility and mobility by running on multiple devices and systems. Pre-programmed and customizable applications with intuitive interfaces and one-step method access for easy data analysis and data/method saving. The proprietary developed NPOS also provides the ultimate level of data security. Easily control the NanoPhotometer® from any PC/Mac and mobile devices via Wi-Fi including any Android or Apple tablet and smartphones. 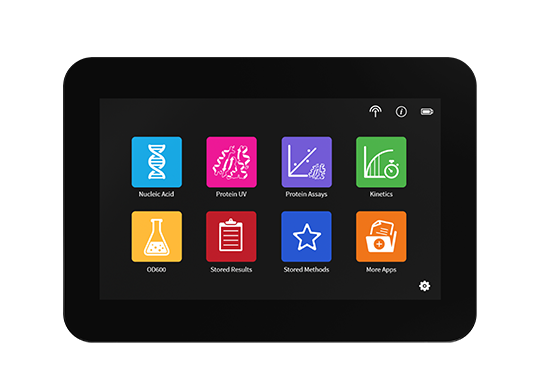 Visit the app store to find the Implen NanoPhotometer® NPOS app for external instrument control and data saving options. The proprietary Linux based operating system with an onboard quad core 1 GHz processor provides fast measurement speed and data processing power. 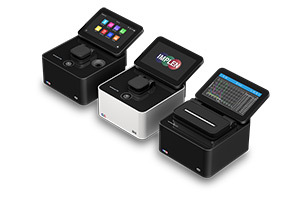 Internal memory allows for the convenience of saving data and methods directly on the NanoPhotometer®.